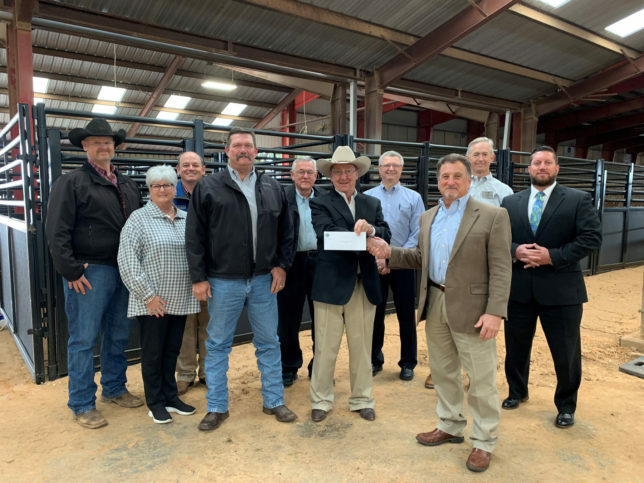 AEDC vice president John Trent presents a $30,000 check to Bob Miars, Henderson County Regional Fair Park board chairman, for the 2018 stall replacement project. The Fair Park Complex was a recipient of AEDC’s Community Development Grant program, receiving matching grant funds toward a multi-year initiative to replace the aging stalls. Pictured are (front row, from left) County Commissioner Chuck McHam, Miars, Trent, (back row, from left) Jim Bob Warren, Fair Park manager; along with Fair Park directors Charla Farrell, Matt Tyler, Ron Welch, Bryan Childress; and AEDC directors Cliff Bomer and Will Traxson. Earlier this year, the Henderson County Regional Fair Park Complex applied for Athens Economic Development Corporation’s Community Development Grant, requesting grant funds to replace 40 stalls in the front barn, at a cost of $66,636. With this portion completed, AEDC board of directors ruled the project in compliance and awarded $30,000 in matching funds toward the stall replacement project. The purpose of the Community Development Grant program is to provide grants for eligible projects which promote sports, cultural, entertainment and community projects that attract tourism and contribute to quality of life, business development and growth of Athens sales tax revenue. Projects being considered must create an economic impact on the city to be eligible. 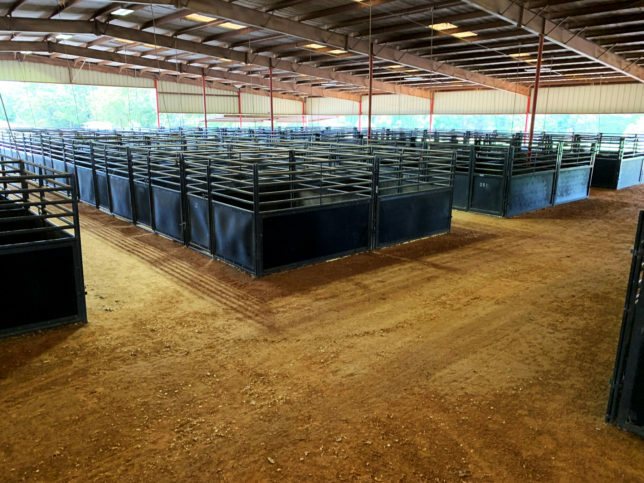 Five years ago, Henderson County Regional Fair Park made the decision to begin a multi-year project to replace the aging equine stalls, with the goal to replace 40 to 60 stalls each year until the project is complete. “Our major events are equine related and are our most profitable,” said Bob Miars, chairman of the Henderson County Regional Fair Park Complex board. With help from AEDC, the stall replacement project is now 60 percent complete. What began as a small footprint more than 45 years ago, today the Henderson County Regional Fair Park Complex encompasses 62 acres, and includes two covered arenas, 330 stalls and 84 RV hookups. If you drive past the fairgrounds on any given weekend, you’ve probably noticed the parking lot is filled with dozens, and at times hundreds, of trucks and trailers belonging to visitors that are in town for a variety of shows the Complex hosts annually. Many of these events generate revenue for the city as visitors stay in hotels, eat in restaurants and buy gas, along with purchasing other items they may need during their stay here.